I found my absolute favorite printable from the internet today on Apartment Therapy. 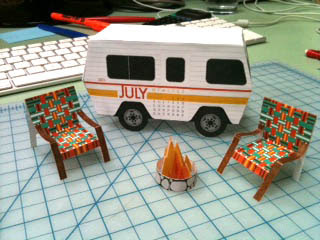 It's a calendar of miniature scenes made from paper for each month. Simple: just print, cut and glue (or use double-stick tape, as I did). You can also take a gander at all of the work they've created for their marketing clients.